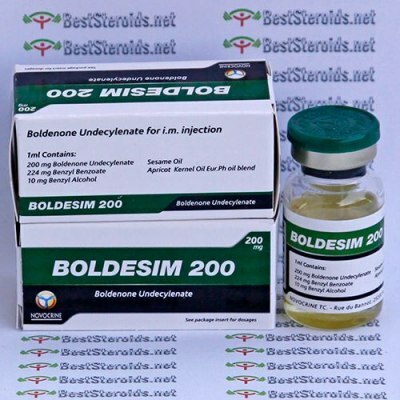 Boldesim 200 (boldenone undeclynate) is not a rapid mass builder, but will provide a slow but steady gain of strength and quality muscle mass. The most positive effects of this drug are seen when it is used for longer cycles, usually lasting at least 10 weeks in length. The muscle gained should not be the smooth bulk seen with androgens, but instead a very defined and solid look. For mass stack it with Anadrol or an injectable testosterone. The result should be an incredible gain of muscle size and strength, without the same intensity of side effects if using the androgen (at a higher dose) alone. When used in a cutting cycle, muscle hardness and density can be greatly improved when combining Boldesim with a non-aromatizable steroid such as Trenabol or Winstrol. In order to maintain stable blood levels, Boldesim should be injected at least once per week. It is most commonly used at a dosage of 400-700mg per week. Ran the product for 12 weeks at 600mg a week. Gave me crazy night sweats (GF didn't appreciate that) and really increased strength. Shipping was quick, landing in less than two weeks to the middle of the US. This is great stuff ,stacked with Test-E. This brand seems most potent to me. it worked as planned and I didnt have to use higher doses to compensate. Great results, will buy again. Good gains stacked wth Prop and Deca. Good solid gains I am seeing vascularity I've never had before. That would be the biggest gain I'd attribute to the EQ. I'am in week 10 of a 14 week testosterone-boldenone cycle. Am running 500mg E of test and 600mg of boldenone. So far my weight is up 14 pounds and am looking much more vascular. Starting noticing an increase in appetite around week 4 and started eating anything that wasn't nailed down around week 6. This is my first cycle using running anything other then just test E, and have noticed that with the Boldesim I am getting more "solid" gains then I was from test alone.